Spectacular, long-lived Lost City vents, showing accretion of vent-building carbonate. The staying power of sea-floor hydrothermal vent systems like the bizarre Lost City vent field is one reason they also may have been incubators of Earth's earliest life, scientists report in a paper published in the July 25 issue of Science. 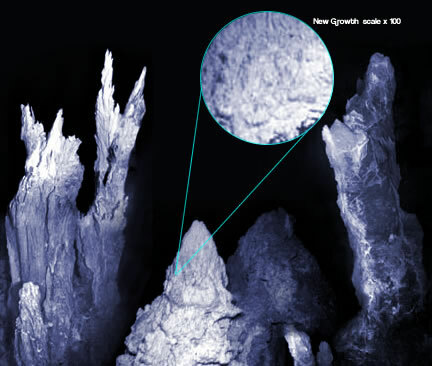 Discovered just two years ago, Lost City has the tallest vents ever seen -- the 18-story-tall vents at that site dwarf most vents elsewhere by at least 100 feet. Water is circulated through the vent field by heat from serpentinization, a chemical reaction between seawater and the mantle rock on which Lost City sits, rather than by heat from volcanic activity or magma, responsible for driving hydrothermal venting at sites scientists have been studying since the early 1970s. The National Science Foundation (NSF), the independent federal agency that supports research and education across all fields of science and engineering, funded the expedition to the mid-Atlantic. If hydrothermal venting can occur without volcanism, it greatly increases the number of locations on the seafloor of early Earth where microbial life could have started. It also means that explorers may have more places than previously thought to look for microbial life in the universe. "The discovery of the Lost City vent field is a wonderful example of serendipity in science—studying one problem and discovering something totally new and unexpected," says David Epp, program director in NSF's marine geology and geophysics program. "The detailed work on Lost City is just beginning, and will change the way all of us think about hydrothermal vent systems." Although the Lost City vent system is a youthful 30,000 years old, Lost City-type systems might be able to persist hundreds of thousands, possibly millions, of years, say lead author Gretchen Früh-Green of Switzerland's Institute for Mineralogy and Petrology and her co-authors. One can imagine how such stable, long-lived systems pumping out heat, minerals and organic compounds for millennia might improve the chances for life to spark and to be sustained until it could take hold, say these scientists. "It's difficult to know if life might have started as a result of one or both kinds of venting," says Deborah Kelley, a University of Washington oceanographer and co-author of the Science paper, "but chances are good that these systems were involved in sustaining life on and within the seafloor very early in Earth's history." Lost City is nine miles from the nearest volcanically active spreading center and sits on 1.5 million-year-old crust. Seawater permeating deeply into the fractured surface of the mantle rocks transforms olivine into a new mineral, serpentine. The heat generated during this the process is not as great as that found at volcanically active sites-where fluids can reach 700 degrees-but it is enough to power hydrothermal circulation and produce vent fluids of 105 to 170 degrees. Tectonics, the movement of the Earth's great plates, contributes to the fracturing of the mantle rock. But a major reason this kind of system is self-sustaining, the scientists believe, is that fracturing also happens because rocks undergoing serpentinization increase in volume 20 to 40 percent. Kelley likens it to water seeping into tiny cracks in roads, then freezing and expanding to cause ruts and frost heaves in the pavement. Scientists think many Lost City-type systems were possible on early Earth because so much of the mantle had yet to be covered over with crust, putting it in contact with seawater and making serpentinization possible, Kelley says. Lost City is the only vent field of its kind known today, but scientists say more could exist. Within a 60-mile radius of Lost City are three similar mountains and there are other, potential sites along thousands of miles of ridges in the mid-Atlantic, Indian and Arctic Oceans. Beyond Earth, peridotite-the mantle material that reacts with seawater during serpentinization-is abundant on planets in our solar system, says Jeff Karson, a geologist at Duke University. "Peridotite can be exposed by tectonic processes or by major cratering events. This means that Lost City-type venting could occur, or has occurred, in oceans on other planets, and such venting would have the potential to support microbial systems." Lost City-type systems also may be conducive to life because their fluids are high pH and rich with organic compounds compared to black-smoker systems. "Smoking" gives more widely known black-smoker vent systems their name. 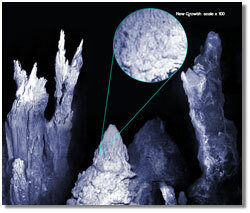 In those systems, dark minerals precipitate when scalding hot vent waters meet the icy-cold waters of ocean depths. Black-smoker vents are a mottled mix of sulfide minerals. The Lost City vents are nearly 100 percent carbonate, the same material as limestone in caves, and range in colors from white to cream to gray. Water venting at Lost City is hot enough to shimmer but not "smoke." Last spring, NSF funded the first major scientific expedition to Lost City since its discovery. Led by Kelly and Karson, the expedition was documented at: http://www.lostcity.washington.edu. The field, named Lost City in part because it sits on a seafloor mountain named the Atlantis Massif, was discovered on December 4, 2000. NSF is an independent federal agency that supports fundamental research and education across all fields of science and engineering, with an annual budget of nearly $5.3 billion. NSF funds reach all 50 states through grants to nearly 2,000 universities and institutions. Each year, NSF receives about 30,000 competitive requests for funding, and makes about 10,000 new funding awards. NSF also awards over $200 million in professional and service contracts yearly.